Charm, Simplicity and Romance- the Firefly Creek Cabin Experience! A place that nurtures the soul and is an escape to a safe, cozy cabin nestled in the woods by a babbling creek. Who doesn’t love that! This is a perfect family and friends getaway. Amenities abound, granite counter tops, all new appliances, completely updated bathrooms and a wood-burning fireplace. From the screen porch out back you can relax with the breeze, the sun and the elements of nature. The spa will satisfy that inner need for quiet as the stresses of daily life melt away. Y’all need this! But if adventure is on the wish list, then the location of Firefly Cabin has so much to offer your family and friends. A two minute ride from the left side of the driveway takes you to Cool River tubing and Zip line tours. Just down from there is Unicoi State Park with scenic drives, a lake & an easy hike to the falls. And speaking of scenic drives, the Richard B. Russell Scenic Highway is just over a mile away from Firefly Creek! This incredible 15 mile scenic drive through the Chattahoochee National Forest offers some of the most spectacular views in the area. Several scenic overlooks dot the highway, and with Ravens Cliff and Dukes Creek Falls along the route, it's a "must see" for anyone visiting the area! But wait, there's more! A five minute ride on the right side of the driveway will take you to Smithgall Woods conservation area. Here you will find one of Georgia’s renown trout streams, and Dukes Creek Trail with lush forests and multiple waterfalls. Don't forget Helen less than 2 miles away and Sautee Nacoochee and oh the wineries! Take the scenic Ridge Road to Helen and see the sights there. Here's a secret - this road will beat the traffic going in to Helen...don't tell anybody! When day turns to fireflies everyone can sit by the fire, sip a glass of wine and let the imagination run wild! This weekend retreat will leave you wanting to come back as soon as possible...... Please do! Wonderful! Relaxing! Will come again! Ashley was fabulous in rearranging our accomodations when the water pump went out at the cabin we had booked and gave us a much needed upgrade! She saved our weekend! Everyone I had contact with was very helpful and professional. My family members who visited were extremely pleased with everything about their visit. The entire experience was that of a perfect vacation! I did not need to interact with any members of your team. I did everything on the computer. There were no issues for which I needed to call the service team. We, as a family, very much enjoyed staying at the Firefly Creek Cabin. It had everything we needed, and was decorated very woodsy and nice. I loved the antler lamps throughout the cabin. It was in a great location for our needs, and we will definitely consider staying at Firefly Cabin again. 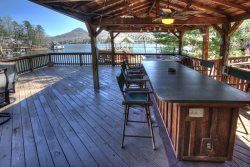 I will be recommending Pinnacle Cabin Rentals to friends. Thanks for the great review, Kathryn! Firefly creek cabin was the PERFECT combo of rustic & plush comfort with modern amenities that we were searching for but not sure we'd find.3-4 minutes from bustling downtown Helen but set in the woods,the first thing I saw driving up was the big welcoming front porch with rocking chairs..then you hear the babbling creek(love!!! ),then that it seems way cooler & refreshing than when we were in the village lunching! The cabin was super comfortable & beautiful..there were a lot of extra touches that we don't usually find with rentals..decor & comfort wise.. super comfy sofa,big beautiful wooden beds..& a HOT TUB on the back screened porch over looking the creek !!! We spent most of our time near the creek/ using the fire pit at night. We plan on booking this cabin to come back in winter,it would be magical to be here near Christmas! Oh,& there really are fireflies at night!! I felt like a kid again.. magical! Everything was super friendly and efficient. Was like talking to friends rather than strangers.. highly recommend! Loved loved loved!!! Will definitely use again! It was very comfortable and beautifully setup. A great house!!! The staff was very helpful and informative. We had a great time in this cabin and hope to return in the future. They replied to my email quickly. We have used Blue Ridge Cabin rentals eight times and they did not have an open property when we tried to book with them. 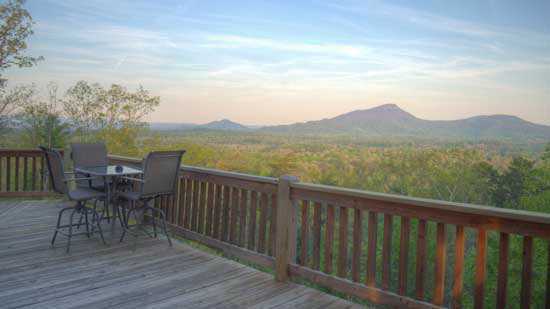 Pinnacle Cabin Rentals had several properties available and the reservation process was easy. I think we have found a new company in Pinnacle to use instead of Blue Ridge. Thank you!